This is a follow on from my last post, where I’d discussed the sawfly problem with a fellow gardener. 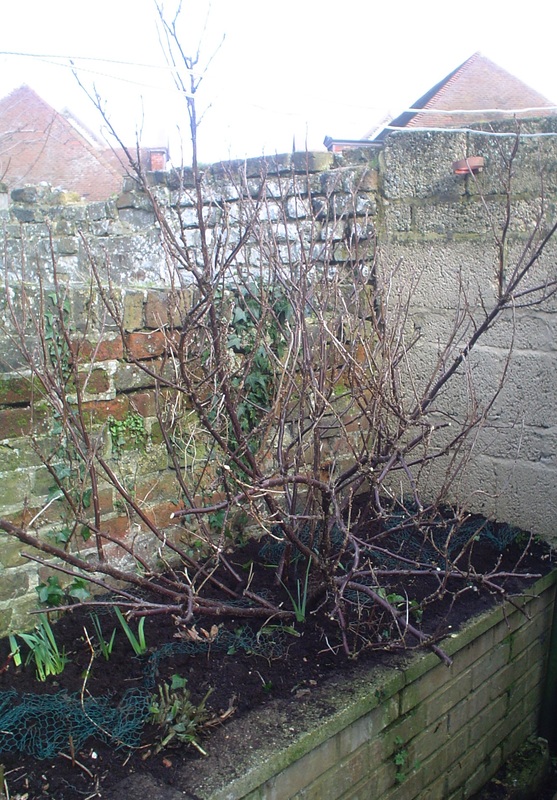 I also had a go at a bit of light pruning, clipping off any diseased twigs and removing one or two big branches that were rubbing up against other branches and generally getting in the way. 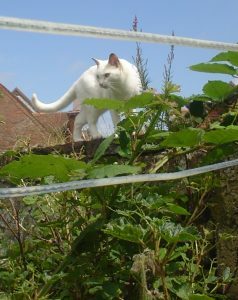 But frankly I still don’t feel I know what I’m doing when it comes to pruning redcurrants. The next stage is to wait till the leaves come out, and pick off any larvae that I find from the undersides. Hopefully most of them won’t have made it that far, thanks to the manure. Encouraged by today’s lovely weather, I also turned over the compost heap, picked off surplus figs from the fig tree and divided the sorrel (grows in a black bucket, not visible in the above pic). We have two redcurrant bushes. (Well, actually we have three – there’s another one in our front garden, doing its best to disguise itself as an ornamental deciduous shrub.) 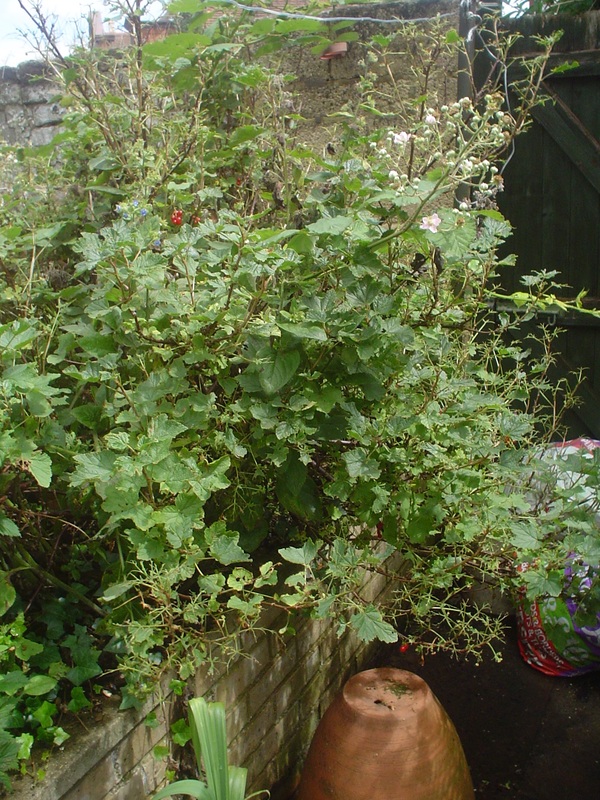 OK then, we have two redcurrant bushes in our back garden. One of them is in an old dustbin and is doing OK (see bottom pic). I picked a couple of punnets’ worth from the dustbin currant on Sunday, and have put them in the freezer. 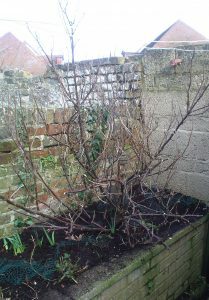 The other bush, which is in the raised bed by the back wall, isn’t faring so well. It’s being eaten up by a mysterious pest, which has destroyed the leaves and nobbled any fruit before they had a chance to develop. The back bed is also a haven for snails; possibly it’s these which are responsible for eating the fruit. I confess I have neglected this bed – I’ve let the brambles run riot and I haven’t pruned the redcurrants, because the whole subject of pruning fruit bushes scares me. 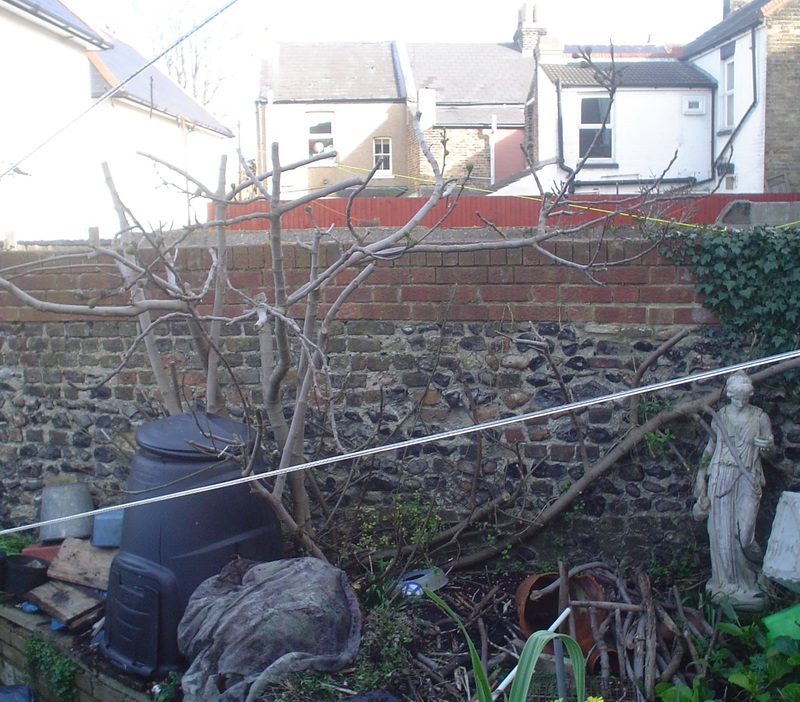 I’m going to have to get over my pruning phobia if I want to get any fruit off this bush next year, and also monitor the bush more closely in the spring for signs of any larvae/insects. From what I understand (http://www.gardenseeker.com/pruning/pruning-redcurrants.html), you need to prune in late winter/early spring and cut back the older growth to the ground, as well as cutting any wispy side shoots from the previous year’s new growth. 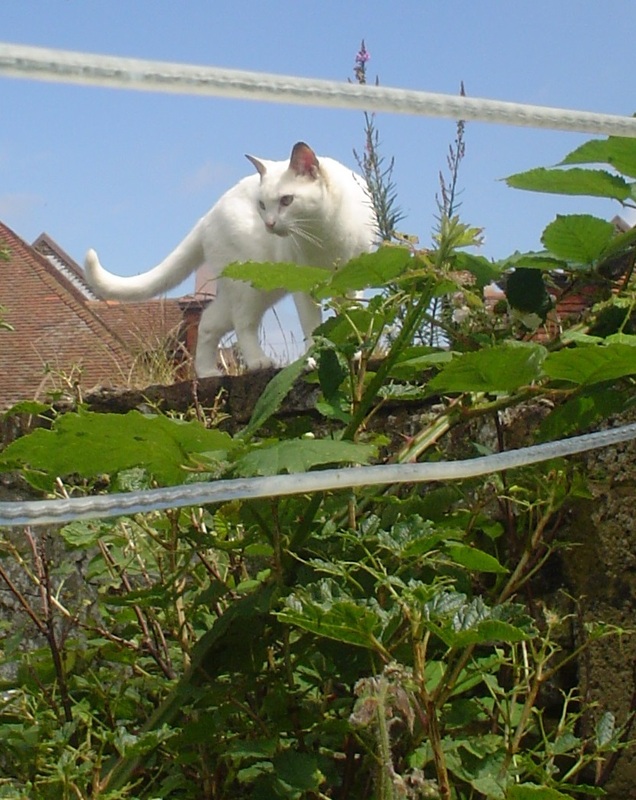 So this post is a reminder to get my secateurs out in early March. At the end of last October, I did a job I’d been meaning to do for a couple of years, but had never quite mustered up the courage for. 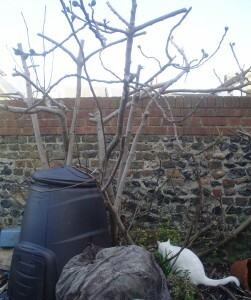 The job in question was to prune our fig tree. It had been planted there by our landlords, who probably didn’t realise just how big this thing would eventually grow. Given that our garden is a tiny triangular courtyard with a few raised beds, a fig tree isn’t the first thing I would have thought of growing there. 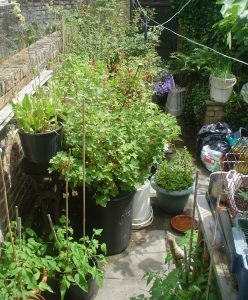 Nonetheless, the tree has flourished and every summer, provides us with a nice crop of gorgeous fruit (try a fig and goat’s cheese salad with olives, home grown tomatoes and rocket. Or chop the figs up and have them with porridge for breakfast). In a temperate climate like Bob’s (and ours), there isn’t enough heat to ripen the main crop of figs (i.e. the crop that develops on any new shoot growth). Only the so-called breba crop, which starts to grow in spring on the previous year’s shoot growth, will actually ripen off properly. So every spring (late March/early April judging by when the video was posted), Bob prunes back any two year old branches, i.e. branches that produced figs the previous year. The one year old branches are left in place, because they’re the ones that will produce the figs this year. The advantage of this system is that your tree never grows any higher, because you’re always chopping back the two year old branches. So this year, our fig tree won’t have many fruit on it at all but as of next year, we shall start to reap the benefits in terms of crop and ease of harvest. Fingers crossed. 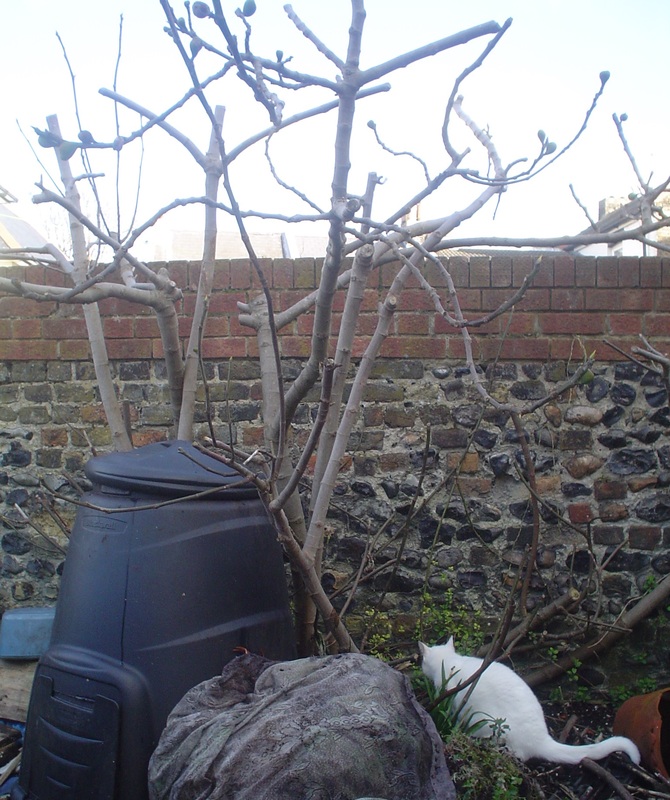 Anyway, the pictures below – taken a couple of weeks ago – show our pruned fig tree, with bonus helpful cat. The strange lump to the right of the compost bin is a pile of clothing, tea towels etc. which are quietly rotting down underneath their covering of nylon net curtain.